Gujarat FortuneGiants trooped into Ahmedabad One mall to enthusiastic shout-outs from the crowd on Saturday. Team members engaged in a crowd connect and familiarisation just before the curtains are drawn on their maiden match on August 1 at the Pro Kabaddi League Season 5. 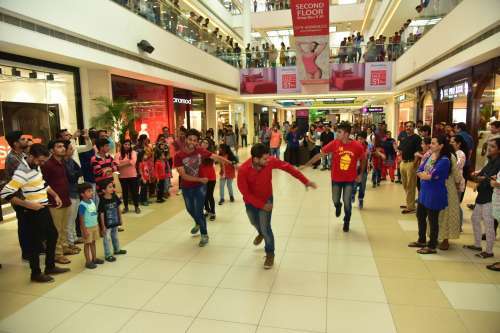 A multiple participatory line-up of events at Ahmedabad One, took the weekend razzmatazz a few notches higher. A Bol Kabaddi Challenge was waiting all prepped up for individuals willing to take it head-on and overcome it, minutely timed on the watch. Winners took home exciting team merchandise for keeps as memorabilia. A lifesize cut-out of the official team jersey placed strategically at Ahmedabad One perhaps held out a foretaste of what is to come. The bright yellow and red combination jersey designed by DDB Mudra with an unmistakable logo depicting the strength and power of the players in one corner of the T-shirt and sleeves, was unveiled right there to resounding cheers from the crowd. The floor was thrown open to the audience to shoot questions at their favorite players and engage in a heart-to-heart. 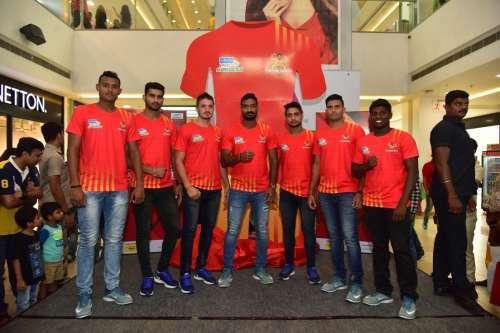 Little known aspects of the homegrown game of kabaddi surfaced, as did awe-inspiring nuggets of information about the stars and their daily regimen. A professional flash mob suddenly conquered the stage with a rejuvenating team anthem playing in the background. The soul stirring feat charged up the venue, laying the foundation correctly to a three-month long league to be played across India, July 28 onwards. Next, a radio jockey engaged the team in an exclusive tête-à-tête. This was not just about kabaddi, but a flurry of contest questions and fun games rolled out the mat of welcome for the players in Gujarat who hail from diverse backgrounds.